COMPETING IDEAS MMS DECEMBER 2018 30 mmsonline.com Manufacturing Management True Continuous Improvement WAYNE S. CHANESKI | COLUMNIST Monthly Kaizen events could help your company improve its operations in 12 ways. There are typically two approaches companies take to improve their operations. The first is a project in which a plan is created to develop the improvement, determine the resources required and schedule its implementation. The second is a Kaizen event during which a group of employees are tasked with making narrowly focused improvements in a short duration of time. Although both approaches to continuous improvement have their benefits, companies that have employed Kaizen events have realized many "good changes" (the literal translation of the Jap- anese word) faster and with less effort. Employee participation in the Kaizen event is key to its success. Employees should be assembled from different departments to bring a variety of perspec- tives and a better overall outcome. The more an employee participates in Kaizen events, the better a participant he or she becomes. In fact, Kaizen veterans are likely to be extremely valuable participants, even during events unrelated to their specific areas of expertise. A Kaizen event can take place anywhere in an organization. I have worked with companies on Kaizen events in machine shops, assembly depart- ments, plating operations, finishing areas, ware- houses, shipping and receiving departments, and even administrative operations such as purchas- ing, accounting, customer service and planning/ scheduling. Every one of these events produced outcomes that exceeded the effort expended. Those of you who have been involved in Kaizen events have probably found similar success. Speaking of success, Kaizen events are known to be a technique in which "success breeds success." 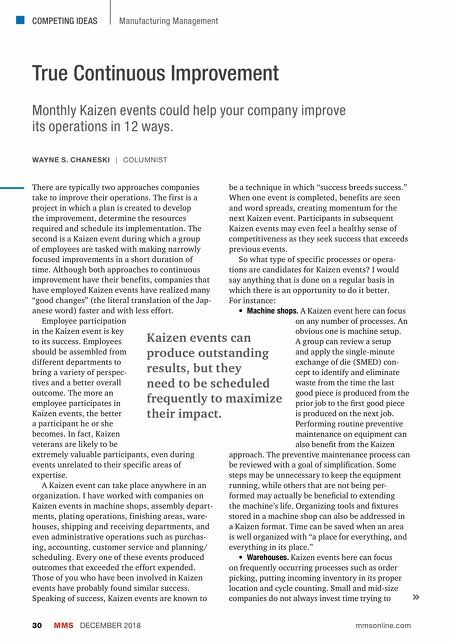 When one event is completed, benefits are seen and word spreads, creating momentum for the next Kaizen event. Participants in subsequent Kaizen events may even feel a healthy sense of competitiveness as they seek success that exceeds previous events. So what type of specific processes or opera- tions are candidates for Kaizen events? I would say anything that is done on a regular basis in which there is an opportunity to do it better. 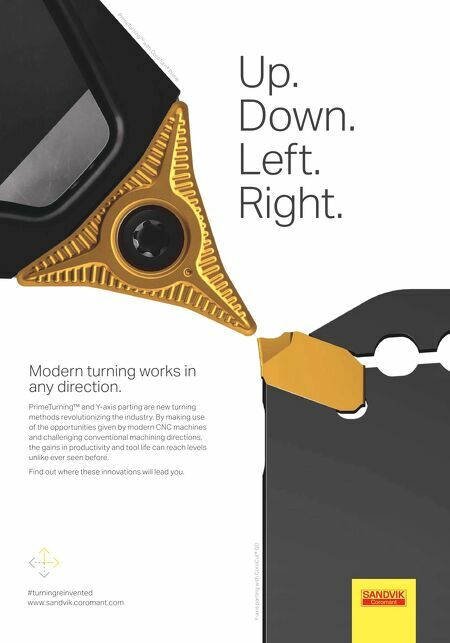 For instance: • Machine shops. A Kaizen event here can focus on any number of processes. An obvious one is machine setup. A group can review a setup and apply the single-minute exchange of die (SMED) con- cept to identify and eliminate waste from the time the last good piece is produced from the prior job to the first good piece is produced on the next job. Performing routine preventive maintenance on equipment can also benefit from the Kaizen approach. The preventive maintenance process can be reviewed with a goal of simplification. Some steps may be unnecessary to keep the equipment running, while others that are not being per- formed may actually be beneficial to extending the machine's life. Organizing tools and fixtures stored in a machine shop can also be addressed in a Kaizen format. Time can be saved when an area is well organized with "a place for everything, and everything in its place." • Warehouses. Kaizen events here can focus on frequently occurring processes such as order picking, putting incoming inventory in its proper location and cycle counting. Small and mid-size companies do not always invest time trying to Kaizen events can produce outstanding results, but they need to be scheduled frequently to maximize their impact.